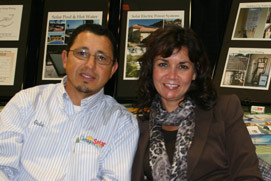 Gabriel and Deborah Alarcon started Cienaga Solar here on the Central Coast in 1985. Their vision was to help people obtain their energy needs from solar power systems and at the same time prevent harmful emissions from entering the air we all breath. Almost 3 decades later, they have installed and serviced thousands of systems in our local community showing their commitment to their field and quality of workmanship. Here's to a cleaner, healthier tomorrow. · CA State Electrical License – C-10. · CA State HVAC License – C-20. · CA State Plumbing License – C-36. · NABCEP certified energy practitioner. The North American Board of Certified Energy Practitioners (NABCEP) is the national certification organization for professional installers in the field of renewable energy. NABCEP is considered the "gold standard" for PV and solar thermal installation certification. Professionals who choose to become certified demonstrate their competence in the field and their commitment to upholding high standards of ethical and professional practice. · Xantrex, Sharp, Sanyo, SMA & Outback. · PG&E, SoCal Gas, BEW Engineering, Southwest Technology Dev Institute. 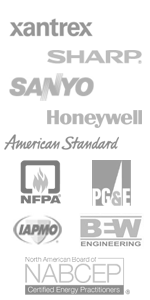 · Honeywell, American Standard, Takagi & Rinnai. · ICBO, IAPMO & NFPA.